The verdict is expected to be made public on December 11, 2012. 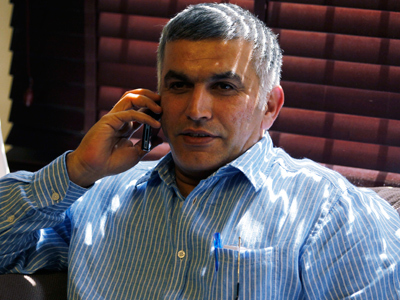 Rajab is no stranger to stalled court proceedings. His case was already adjourned twice before, in both September and October. Rajab has been jailed since July, when he was arrested for organizing and participating in three illegal demonstrations between the months of January and March 2012. He was given a three-year prison sentence in August. Human rights organizations have been stepping up pressure to get him freed ever since. Both the Observatory for the Protection of Human Rights Defenders and the World Organization Against Torture has spoken out against the court’s decision, claiming the ruling is unjust. “The issue of the legality of the law on gatherings is key. I deeply regret that the court refused to refer this fundamental question to the Supreme Court. It sends an alarming signal as to what could be the final outcome of this judicial process,” Souhayr Belhassen, president of the International Federation for Human Rights, said in a statement. 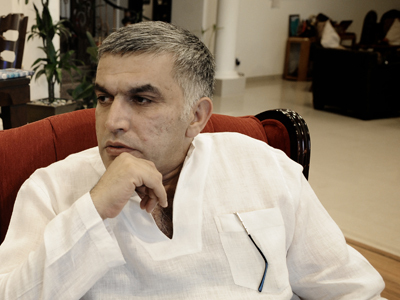 Human Rights Watch spoke out against Rajab’s conviction last month, calling it a violation of his right to freedom of peaceful assembly, since authorities have failed to present evidence that he advocated or participated in violence during protests. It’s a claim that Bahraini prosecutors would have disagreed with during Rajab’s Thursday hearing, when they showed eight videos to the court. Five of the videos showed images shot by the police at the demonstration for which Rajab was arrested. But defense lawyers responded by showing three videos of their own – which contain speeches and interviews attesting that Rajab advocated for non-violence. One particular video showed a demonstration during which the human rights activist was charged and hurt by police. Another showed extracts from a pro-government television broadcast which cast Rajab as a dangerous person. Rajab’s supporters maintain that he has done nothing wrong. “He has the basic right to peaceful assembly, and shouldn’t be sent to prison for that,” said deputy Middle East and North Africa director at Human Rights Watch, Joe Stork. Instead, many believe the police are the ones at fault. 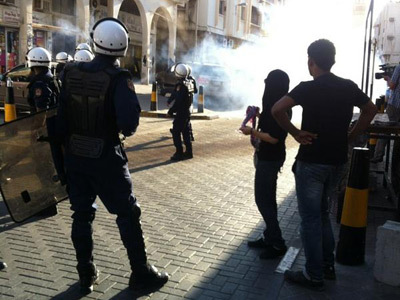 Bahraini officers have been accused of brutal attacks, and midnight raids at checkpoints. At the end of October, the government imposed an official ban on protest gatherings and rallies. The Tuesday ruling makes rallies and gatherings illegal, while imposing legal retribution against anyone calling for or taking part in them. The restriction met condemnation from UN chief Ban Ki-moon, who said it violates international human rights standards, including respect for freedom of expression and peaceful assembly. Harsh crackdowns against the opposition by the Gulf kingdom's rulers have prompted widespread condemnation from human rights groups. Numerous responses by security forces have already claimed lives of dozens, including children. At the same time, the United States has been criticized for turning a blind eye to crackdowns against the opposition. Some critics link that to the fact that Bahrain currently hosts the US Navy's Fifth Fleet, which is responsible for their maritime forces in the Persian Gulf and Arabian Sea. 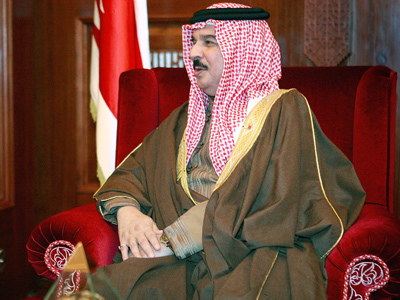 Bahrain has been hit with unrest since February 2011, when its Shia Muslim majority sparked an uprising, demanding a greater political voice in the Sunni-ruled country. Around 3,000 people have been arrested since the movement began.